This border was established as part of the Treaty of Maastricht in 1843 (see below). The orange portions are part of the national territory of the Netherlands. inland archipelago, are part of Belgium. History has left a territory composed of two municipalities, whose shape is unique, belonging partly to the Netherlands and partly to Belgium. Earlier both parts belonged to the former Duchy of Brabant, a territory that is now split up into the Dutch province of Noord-Brabant (including Baarle-Nassau) and the Belgian provinces of Antwerp (which includes Baarle-Hertog), Vlaams Brabant, Brussels and Brabant-Wallon. People are quite comfortable with this situation, even though it raises so many complicated and difficult problems that even the most brilliant jurists are puzzled. Baarle-Hertog is called on older Belgian maps Barle-Duc (Hertog = Duke, fr: duc) and must not be confused with the prefectoral town of Bar-le-Duc, Meuse, France. The year of Baarle's founding is not known precisely. The name appears for the first time in 992, in a "false charter", when Countess Hilsondis, the wife of Ansfried, donates her properties, including Baarle, to the abbey of Thorn in the Dutch province of Limburg. At the end of the 12th century, Godfried of Schoten, the Lord (Sieur, Seigneur) of Breda, owned Breda Castle and the territory around the castle extending to the east and north. His ancestors had bought the territory (as a perpetual and free land ownership) from the ancestors of Hendrik I, the Duke of Brabant. In those days, however, many a dispute concerning the ownership of the land divided the Duke of Brabant and Dirk VII, the Count of Holland. Probably in response to threats, Godfried gave the territory to the Duke by grace of the Charter of 1190. Nevertheless Duke Henry immediately gave the territory back to Godfried, but in the form of a loan. Godfried thereby acknowledged the Duke as the proprietor, and this caused the Count of Holland to declare in 1203 that he renounced his rights on the territory. To express his gratefulness towards Godfried, the Duke of Brabant added large sections of forest and tourbières (dried swamp with a deposit you can burn) to the property he had on loan, territory previously not belonging to Godfried. Nowadays we see this period in another light. In the 12th century Baarle is located in a rather peripheral region in which none of the regional counts (of Holland, Louvain/Brabant, Gelre) or bishops (Utrecht, Liège) enjoys a firm grip on the surrounding territory. A number of local lords owned their own village and some of them succeeded in becoming a regional lord, like the Lord of Breda. In the period 1190 - 1235 the Count of Louvain/Brabant expanded his power from the south over a large part of this region, while the Count of Holland expands from the Northwest. A big clash occurred in 1203, from which time both regions of influence were more or less clearly demarcated. In the years before 1203 the lord of Breda took sides with Louvain/Brabant while the Lord of Strijen elected for Holland. Indeed the Count of Louvain gave up all his claims in the north west and gave them in fief to the lord of Breda. Those documents are now dated "ca. 1198" (One can find in older literature: 1169, 1190, 1196, ca. 1200.) This shows the importance the acquisition of the support of Breda had for the Count of Louvain in his confrontation with Holland. Other local and regional lords in that part of the region called "Brabant" from 1203 were afterwards swallowed up by Brabant without such compensation. Only after 1235 does the Count of Louvain/Brabant present himself as Duke of Brabant. Baarle was at this time not the only collection of enclaves and the enclaves were not the only inhabited parcels. The count of Louvain kept his personal feudal link with the people in the region that already before 1198 had sided with him. These persons and their houses and fields in various places like Heerle, Roosendaal, Nispen, Sprundel, Hage, Zundert, Wernhout and in Baarle, came to fall under the jurisdiction of Zandhoven, a countal court east of Antwerp. In the medieval sources you can find "Hage-Hertog", "Zundert-Hertog" and so on, and not only "Baarle-Hertog". 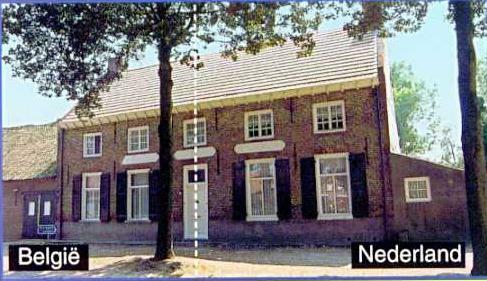 In fact Baarle-Hertog consists completely of ducal fiefs and fiefs of rented out parcels of those fiefs. Dating from that moment, a difference was born between those parts of Baarle under the Duke of Brabant, and those parts of Baarle (and Heerle, Wernhout, etc.) under the Lordship of Breda. The presuppositions for the existence of BAARLE-NASSAU were thus created around 1198, but it is only from 1404, when the Counts of Nassau in Germany became also Lord of Breda, that the name "Baarle-Nassau" can be found. What is remarkable is that the partition of the territory did not change across all succeeding historical events. Many opportunities presented themselves to eliminate the Baarle enclaves over the course of the last 800 years, but none succeeded. In 1327 - 1339 there was no Lord of Breda. The Land of Breda belonged directly to the ducal domains. The fiefs held from the Lord of Breda were now held from the Duke in Brussels. We can still see the mix up with "real"ducal fiefs like those of Baarle-Hertog in the registers in Brussels. In 1334 a number of villages, including Baarle-Breda, were pawned to Van Liedekerke. During the short period 1327 - 1334 it would have been easy to erase the enclaves in all those villages, but it did not happen. In around 1388 the Duchess of Brabant was in need of money to wage war. To raise these funds she sold or pawned a number of ducal domains. In 1388 her jurisdiction over the enclaves in the Land of Breda was pawned to the Lord of Breda. The pawn was never redeemed. However, the jurisdiction over Baarle belonged since 1356 to her sister Maria of Brabant (Land of Turnhout) and was therefore not a part of this transaction. Thus while most enclaves disappeared already in 1388, those in Baarle escaped. From around 1500 the Kings of Spain were Lord over the 17 Provinces in the Low Countries previously ruled by Burgundy. The 80 Years War split these 17 Provinces into the Republic of the 7 United Provinces and the rest, known as the "Southern Netherlands". The northern part of the old Duchy of Brabant was annexed by the Republic which acquired the status of occupied territories under the name "Staats Brabant". In 1648 Spain and other countries officially recognized the Republic. As far as Baarle is concerned, Henry III was followed as Count of Nassau and Lord of Breda by René of Chalons, Prince of Orange (in France) and then by William of Orange, the central figure in the Dutch revolt against Spain. From there the line runs down to Queen Beatrix of the Netherlands in our own day. In the North the Republic of the 7 United Provinces survived up to 1795. Then from 1795 to 1806 these provinces form the so-called "Batavian Republic" with "Bataafs Brabant" (the former "Staats-Brabant") as a normal province. From 1806 to 1810 they form the Kingdom of Holland; from 1810 they are part of the French Empire until they are liberated at the end of 1813 with William of Orange as sovereign. In the South the rule of the Spanish King gives way to that of the Austrian emperor. Then in 1793 comes annexation by France, first as part of the Republic and then of the Empire, with liberation at the end of 1813, when the Congress of Vienna decides that the North and South shall be united under King William of Orange I as the United Kingdom of the Netherlands. In 1830 the two are split again: in the South we have the Kingdom of Belgium; in the North the Kingdom of the Netherlands. One half-province (the eastern part of greater Luxemburg) becomes a separate Grand Duchy initially under William I but from 1890 under its own Grand Dukes. With the Peace of Munster of 1648, one of the treaties of Westphalia putting an end to the 30 Years War and also to the 80-Year-War of the Netherlands against Spain, it was decided that the portion of Baarle under the Count of Nassau should be added to the "Generaliteitslanden" (The United Provinces), because this part belonged to the Baronie de Breda; and that the portion of Baarle belonging to the Land of Turnhout should be added to the Spanish Southern Netherlands (the present Belgium). In this way the enclaves survived the Peace of Munster. In the Treaty of Fontainebleau of 1785, between the Dutch Republic and Emperor Joseph II, a committee was ordered to make proposals for the exchange of territories so that the enclaves would disappear. Protests from Baarle-Hertog delayed the work of the committee so much that nothing happened before the annexation of the Southern Netherlands by France. Between 1810 - 1832 the whole of the Netherlands (North and South) was measured and mapped for the land taxes imposed by the French Empire and later the Kingdom of the United Netherlands. Each "village" became a cadastral municipality. It was then thought wise to make one cadastral municipality "Baarle" and the maps and registers were made on that basis. But Baarle-Hertog was part of the province of Antwerp and Baarle-Nassau was part of Noord-Brabant. So a formal provincial border correction was needed. Everything was prepared and agreed upon informally. The provincial government of Noord-Brabant agreed to the proposals on July 5th and the Antwerp provincial government planned to do so in September 1830. In the summer of 1830, however, there occurred the Belgian Revolution. So the unified cadastral municipality had to be split up once again. This was done by colouring the Belgian parcels on the cadastral maps. But some parcels were forgotten in this process, and some could not be dealt with so easily since they were were partly Belgian and partly Dutch: these had been thrown together into single parcels because the mapmakers had assumed that the partition of the village would shortly disappear. The Treaty of Maastricht of 1843 delimited the boundary between the Netherlands and Belgium, but even then it was found impossible to compromise on the territory of Baarle. It was instead decided to leave things as they stood, for it was impossible to define the boundary between boundary poles 214 and 215 (about 50 km). A new committee, set up by Belgium, began its exploration of the possibilities for an exchange of territories in 1875. Only in 1892 was a draft agreement between the both countries ready, but it was not accepted by both parliaments. In 1996 plans were made to form bigger municipalities in the Netherlands and in Belgium. So Baarle-Hertog would become a part of Turnhout and Baarle-Nassau would form together with Alphen and Chaam a new entity (the "ABC-municipality"). This implied that the distance between the two centres of municipal gouvernment, now about 200 meters, would increase to 15 kilometres. This would make the long-existing strong contacts between both municipalities rather impossible. Both the Dutch and the Belgian parliaments voted against the disappearance of the municipalities of Baarle-Nassau and Baarle-Hertog. So they still exist although they are in population terms among the smallest municipalities of both countries. Living in a extremely enclavated village such as Baarle brings its own problems but also unique opportunities. As each house is deemed to pay taxes in the country where its front door is located, it is an old tradition in Baarle to move the front door some meters if that is profitable for the taxes, especially for shops. This is part of making the best out of a strange situation. In 1995 a remeasurement of all the borders of enclaves according to modern exact standards was completed. This gave rise to some problems of this kind. In at least one case a house would have had to move from Belgium to the Netherlands. The inhabitants did not want that to happen, but the solution was simple: they moved the front door of their house. One formerly Dutch meadow (with one cow grazing there) "moved" in 1995 from the Netherlands to Belgium, as it was recognised that it had to be a Belgian parcel. Also in the open countryside the border situation brings problems and opportunities. The valley of the river Merkske is divided between both villages/kingdoms. This made it impossible for the re-allotment and land-improvement people to do there a lot of harm, as happened elsewhere. So this is now one of the ecologically richest areas in the whole region. The village Baarle attracts a lot of touristic trafic. For many years the shops in Belgium were open on Sundays, those in the Netherlands not – with the exception of those in Baarle. Taxes in Belgium and The Netherlands differed sometimes a lot, so one could go shopping between two tax-regimes in one single street. And don't forget the Belgian chocolate, you could not find that quality in The Netherlands. With the coming of the European Union some of those differences disappeared. To make the enclaves visible for the visitor, the little plates with the house numbers are made to look different: ovals with the Belgian colours and rectangles with Dutch colours. Officially a letter goes by post from Hertog over Turnhout to Brussels and than by air to Amsterdam, and for the last part of the journey over Tilburg to Nassau. But if you use the letterbox in the next street, the letter doesn't leave Baarle at all! For the understanding of the good relationships between the people of both Baarles it is important to know that they formed up to 1860 one Catholic parish. Only then did the Bishop of Breda find it unacceptable that some of "his" souls would go to a church in a "foreign" country, and so he created a separate parish for Baarle-Nassau. Another important relation betwee both communities was the common use of the heathlands, as is documented since 1479. In the medieval agricultural system on the sandy soils of this region the extensive use of the heather played an important role. The common parish and heather made Baarle for the local people a single community. Only the external lords, dukes and kings made the problems with taxes compounded later by the increasingly separate developments of the two modern societies of the Netherlands and Belgium. The splitting up of the parish and the efforts to create bigger municipalities are exemples thereof. Even now some think the situation in Baarle is something to be regreted. The inhabitants of Baale think otherwise. They do not want to lose their special ambiance and they want to keep Baarle as it is now: Baarle-Nassau and -Hertog, a historically, geographically and politically peculiar village. Not only in Europe, but – with the exception of the exclaves in Cooch-Behar: see below – in the whole world, Baarle is a historical-juridical monument of world class. Map of Baarle: Blue = Baarle-Hertog; Red = enclaves of Baarle-Nassau; white = main body Baarle-Nassau.